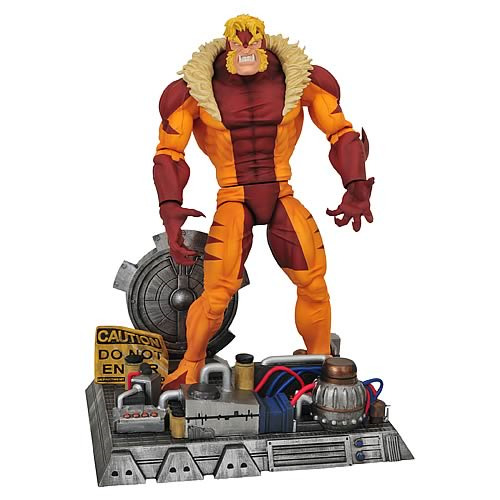 Action figure of Sabertooth from the pages of Marvel Comics. He's one beast of a collectible! Features multiple points of articulation and an amazing base. Wolverine's arch-nemesis! Presenting a new take on a classic villain, this fantastic 7-inch tall action figure features Wolverine's most hated enemy… Sabretooth. Straight from the pages of Marvel Comics history, Sabretooth is presented in his characteristic costume. He features an amazing deluxe base and multiple points of articulation. Designed by Dig Deep Entertainment and sculpted by Gentle Giant, this is one heavy-hitting mutant and a beast of a collectible that you don't want to miss!